On August 3, 2017, the VA published their final changes to the ratings for Dental and Oral Conditions. Of the nine sets of changes that have been proposed as part of the VA’s complete rewrite of the VASRD, this is only the second to have been made official and final. The other finalized changes were to the ratings for Mental Disorders in 2014. Other proposed changes include the Hemic and Lymphatic System, the Female Reproductive System, The Eyes, the Endocrine System, the Skin, the Genitourinary System, and the Musculoskeletal System. The following changes will go into effect September 10, 2017, and we’ll officially update all the information on our website at that time. Any Dental and Oral Conditions rated on or after September 10th will be based on these new ratings. The following are the changes to the ratings for Dental and Oral Conditions. The indented bits are the codes as they are now. I’ll then discuss the changes after. If you click on the code number, it will take you to the discussion of that code on our site which includes additional definitions and anatomical images. The VA’s first change is to add a few explanatory notes to the beginning of this section. Some dental and oral conditions require that they be diagnosed via “imaging studies.” The first note specifies that “imaging studies” means tests like X-rays, CT scans, MRIs, PETs (positron emission tomography), radionuclide bone scans, and ultrasonographies. While these tests are specifically listed, the note also states that these are not the only acceptable tests, just the most common. Any test that can clearly and fully provide enough data to diagnose the condition and its severity is acceptable, but proof of these tests must be included in the medical evidence in order for the condition to be fully ratable. The second note states that any loss of smell, loss of taste, nerve damage, respiratory problems, loss of the ability to speak, and other additional symptoms caused by any of these conditions can be rated separately. These codes are basically just for any physical and mechanical conditions of the mouth and teeth (loss of bone, inability to chew, etc.). All other symptoms can be rated separately. That’s it for the notes. Now on to the conditions. Code 9900: Osteomyelitis or osteoradionecrosis of the mandible or maxilla is rated under code 5000, osteomyelitis. -New- Code 9900: Osteomyelitis, osteoradionecrosis, or osteonecrosis (a.k.a. “ONJ”) of the mandible or maxilla is rated under code 5000, osteomyelitis. The only change to this code is to add osteonecrosis as a condition that is rated here in addition to osteomyelitis and osteoradionecrosis. Osteonecrosis of the jaw (a.k.a. ONJ) is a condition where the gum recedes and exposes the jaw bone (maxilla or mandible). This decreases the blood flow to the bone, which in turn causes the bone to weaken and deteriorate. Just as the other two conditions under this code, it will also be rated as osteomyelitis under code 5000. Code 9901 remains exactly the same. Code 9902: If about half of the mandible is missing and the jaw is unable to move or is limited in its movement, then it is rated 50%. If the jaw motion is not affected, then it is rated 30%. This code is expanded quite a bit in order to better rate the varying degrees of disability that occur when any amount of the mandible is missing, not just half, and in instances where the loss can and can’t be replaced by a prosthesis. Currently, there are two separate codes (9906 and 9907) that rate any loss of the ramus (the back part of the mandible), but since the ramus is a part of the mandible, having separate codes for it doesn’t really make sense. Thus, the VA proposes to remove the two ramus codes and instead combine all ratings for the entire mandible under just this one code. Additionally, the VA recognizes that loss of the mandible affects many different aspects of the mouth, including the tongue, the ability to chew, and the ability to swallow, and can cause significant disfigurement of the face. Because of this, the VA has added higher ratings than currently allowed to better cover the significant disability that comes with this condition. Disfigurement can, of course, be rated in addition to a rating under this code. -New- Code 9902: Any partial loss of the mandible, including the ramus, is rated under this code. If at least half or more of the mandible is missing, it is rated 70% if it interferes with the ability to chew and cannot be replaced by a prosthesis, 50% if it interferes with the ability to chew but can be replaced by a prosthesis, 40% if it does not interfere with the ability to chew and cannot be replaced by a prosthesis, and 30% if it does not interfere with the ability to chew and can be replaced by a prosthesis. If less than half of the mandible is missing, it is rated 70% if it interferes with the ability to chew and cannot be replaced by a prosthesis, 50% if it interferes with the ability to chew but can be replaced by a prosthesis, 20% if it does not interfere with the ability to chew but cannot be replaced by a prosthesis, and 10% if it does not interfere with the ability to chew and can be replaced by a prosthesis. Code 9903: If the mandible has been broken and did not heal back together, then it is rated 30% for a severe limitation and 10% for a moderate limitation. -New- Code 9903: If the mandible has been broken and did not heal back together correctly (nonunion or fibrous union), then it is rated 30% if there is abnormal or additional motion at the point of the break and 10% if there isn’t any additional or abnormal motion. This condition must be clearly shown and diagnosed by an imaging study. This code was adjusted to more clearly define the “limitation” caused by nonunion of the bone. The “severe limitation” and “moderate limitation” terms used in the current code are rather vaguely defined, and so left up to interpretation. Under the new code, however, the higher rating will simply be applied any time there is additional or abnormal motion at the point of the break, and the lower rating will be applied if there isn’t any abnormal motion at the point of the break. Code 9904: If the mandible has been broken and did heal, but not correctly so that there is a definite disfigurement to the bone, then it is rated 20% for severe, 10% for moderate, and 0% for slight. -New- Code 9904: If the mandible has been broken and did heal, but not correctly so that there is a definite disfigurement to the bone (malunion), it is rated under this code. If the disfigurement causes a large gap between either the front teeth or the back teeth when the jaw is closed, it is rated 20%. If it causes a small gap between either the front teeth or the back teeth when the jaw is closed, it is rated 10%. If it does not cause a gap between the teeth at all, then it is rated 0%. Just as with the last code, the rating requirements for this code are currently not clearly defined. To better understand a “severe”, “moderate”, and “slight” condition, the VA proposes to better define the expected disability resulting from a malunion by basing the rating on the main symptoms, a gap between the front or back teeth when the jaw is closed that thus interferes with the ability to chew. Code 9905: All other jaw joint conditions (including TMJ) are rated based on limited motion of the joint. The jaw can move in two directions: open and closed, and side-to-side. Only one direction of motion can be rated. If the jaw can’t move side-to-side or open and close, then only the one that will give the higher rating is used. If the jaw can’t move side-to-side more than 4 millimeters (mm), then it is rated 10%. If the jaw can’t open more than 10 mm (about 0.4 of an inch), then it is rated 40%. If it can open between 11 and 20 mm (about 0.4 to 0.8 of an inch), it is rated 30%. Between 21 and 30 mm (about 0.8 to 1.2 inches) is rated 20%, and between 31 and 40 mm (about 1.2 to 1.6 inches) is rated 10%. -New- Code 9905: Temporomandibular disorder, (known as “TMD” and also incorrectly referred to as “TMJ”) is rated based on limited motion of the joint and the ability to eat regular or mechanically altered food. “Mechanically altered foods” include liquid, blended, chopped, pureed, ground, mashed, soft, and semisolid foods. A physician must record that your condition requires you to eat only mechanically altered foods in order for it to be rated. If a medical record does not state this, then it’ll be assumed that you are able to eat normally. For limited motion, the jaw can move in two directions: open and closed, and side-to-side. Only one direction of motion can be rated. If the jaw is limited in both directions, then only the one that will give the higher rating is used. Only unassisted motion is used to rate limited motion, so even if the jaw could open further with help, it is only rated on how far it can move naturally without assistance. If the jaw can’t open more than 10 mm (about 0.4 of an inch), then it is rated 50% when only able to eat mechanically altered food, and 40% when able to eat normally. If it can open between 11 and 20 mm (about 0.4 to 0.8 of an inch), it is rated 40% when only able to eat mechanically altered food, and 30% when able to eat normally. If it can open between 21 and 29 mm (about 0.8 to 1.1 inches), it is rated 40% when restricted to full liquid and pureed foods only, 30% when limited to soft and semi-solid foods only, and 20% when able to eat normally. If it can open between 30 and 34 mm (about 1.2 to 1.3 inches), it is rated 30% when restricted to full liquid and pureed foods only, 20% when limited to soft and semi-solid foods only, and 10% when able to eat normally. The VA made quite a few changes to this code. This condition is still technically rated on limited motion, but additional factors, like the types of food that can be eaten because of the limited motion, is also used when rating. The new code also specifies that the measurements are for unassisted opening, meaning that the jaw could open further by pulling down on the jaw or other assisted means, but by itself, it is limited to these measurements. The ratings for side-to-side limited motion and the requirement that only side-to-side or open-and-closed motion, not both, can be rated remain the same. Code 9906: If more than half of the ramus is missing and the ability to chew or move the jaw is limited, then it is rated 30% for one side and 50% for both sides. If the ability to chew or move the jaw is not limited, then it is rated 20% for one side and 30% for both sides. This code is deleted since any loss of the ramus is now covered under code 9902. Code 9907: If less than half of the ramus is missing but the jaw function is not limited, then it is rated 10% for one side and 20% for both sides. Code 9908 remains the same. Code 9909 remains the same. Code 9911: If half or more of the hard palate is missing and cannot be replaced by a prosthesis, then it is rated 30%. If it can be replaced by a prosthesis, then it is rated 10%. 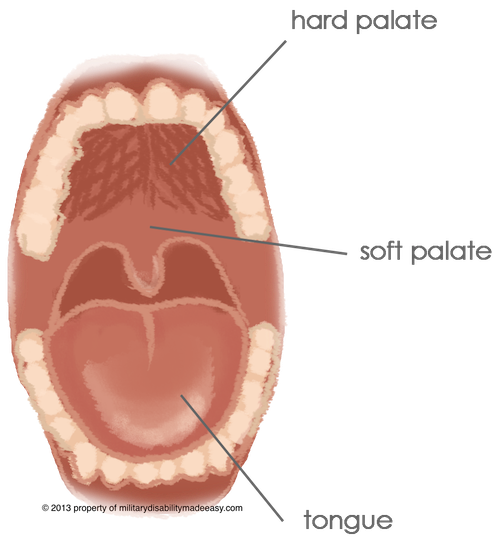 -New- Code 9911: If any portion of the hard palate is missing, it is rated under this code. If half or more has been lost and it cannot be replaced by a prosthesis, it is rated 30%. If less than half has been lost and it cannot be replaced by a prosthesis, it is rated 20%. If half or more has been lost and it can be replaced by a prosthesis, it is rated 10%, and if less than half has been lost and it can be replaced by a prosthesis, it is rated 0%. All they did to this code was combine it with code 9912. The ratings and requirements are exactly the same, just under one code now instead of two. Code 9912: If less than half of the hard palate is missing and cannot be replaced by a prosthesis, then it is rated 20%. If it can be replaced, it is rated 0%. This code is removed and instead, all hard palate ratings are covered under code 9911. Codes 9913-9915 remain the same. Code 9916: If the maxilla has been broken and hasn’t healed back together or has healed incorrectly, then it is rated based on how severely the bone has been disfigured and thus limits its ability to function. If it is severely disfigured, it is rated 30%. If it is moderately disfigured, it is rated 10%. If it is slightly disfigured, it is rated 0%. -New- Code 9916: If the maxilla has been broken and, after treatment, hasn’t healed back together (nonunion) or has healed incorrectly, causing definite disfigurement to the bone (malunion), it is rated under this code. For nonunion, if there is abnormal motion at the point of the break, then it is rated 30%. If there is no motion at the point of the break, then it is rated 10%. To qualify for rating, a nonunion must be clearly shown and diagnosed by an imaging study. For malunion, if the disfigurement causes a large gap between either the front teeth or the back teeth when the jaw is closed, it is rated 30%. If it causes a medium gap between either the front teeth or the back teeth when the jaw is closed, it is rated 10%. If it causes only a small gap between the front teeth or the back teeth, then it is rated 0%. The current rating requirements for this code are rather vague, basing its ratings on “severe”, “moderate”, or “mild” disfigurement. To make the requirements more clear and more applicable to the true disability associated with this condition, the new code separates and establishes different rating requirements for nonunion and malunion, as is done for the mandible under codes 9903 and 9904. The new rating requirements are also similar to the ratings for the mandible, with nonunion based on the presence of any abnormal motion and malunion based on the presence of a gap between the teeth. In fact, the ratings for nonunion under this code are identical to the ratings for nonunion of the mandible under code 9903. -New- Code 9917: All benign neoplasms (tumors or oral lesions) of the mouth and teeth are rated on the main structures of the mouth that they affect. So if the tumor affects the teeth, it would be rated under code 9913. If it affects the hard palate, it is rated under code 9911 or 9912. If it causes disfigurement, it is rated under code 7800, etc. Currently there aren’t any codes specifically for cancer that affects the mouth and teeth, so the VA is adding two new codes (this one and code 9918) to cover all cancer, both benign and malignant. It is basically just rated on any symptoms or functional impairment (inability to chew, etc.) that it causes. -New- Code 9918: All malignant neoplasms (tumors and lesions) of the mouth and teeth are rated 100% while the condition is active and undergoing treatment. This 100% rating will continue for 6 months following the last treatment, at which point the VA will re-examine the condition and rate it based on any remaining symptoms, like loss of teeth or disfigurement. Just like code 9917, the VA is adding this new code to cover malignant cancer of the mouth and teeth.